This is the second time I have used 1StopFlorist, and they do not disappoint. They just use better florists, than any other group online, I have ever used....would totally recommend them for any floral/balloon occasions. They were excited about the gift when they saw it. You made it easy. In a few minutes I had a great gift sent acrosss the country to my granddaughter. The teddy bear was soft & cuddly, and the get well soon balloons were bright & cheerful. My husband loved them. A truly wonderful surprise gift! My bouquet was a huge surprise so therefore a huge success!! Delivered on time ! Thanks...will use your services again. 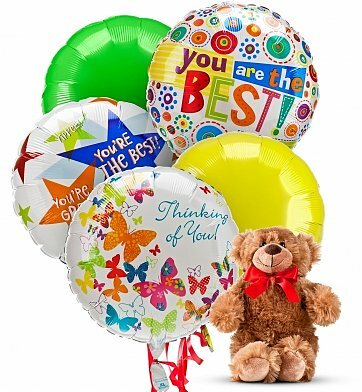 Our grandson loved the balloons and teddy bear, and they were delivered very soon after I ordered them from across the country! Very prompt service, follow through on inquiry, verification and confirmation were awesome! Item sent was very much appreciated by his mom as well. Wrong balloons sent. Called and corrected same day! Very professional and Grandaughter was pleased. He loved the bear and balloons. Excellent for a child who is sick or hurt to make them feel better. My granddaughter was pleased with this gift. I was very impressed with your balloon presentation! It made his day! Thank you! My three year old grandchild was very happy with the Birthday balloons and bear she received. I had used another balloon place in the past and was very unhappy with that service. I would definitely use again. I am always hesitant to order without seeing the final product, however, the balloon bouquet and bear were more beautiful than I expected! Our 4 yr old granddaughter received the gift after a hospital stay and she was ecstatic when they were delivered. The bear was white and as big as she is - I had my daughter put a band aid on the bear - same place my granddaughter's boo boo was. Thank you for your prompt service and exceeding our expectations! My mom needed a pick me up and this balloon bouquet and stuffed bear were just perfect. Thank you for providing her with such a wonderful experience at such an affordable price! Sent this to our young granddaughter who was recovering from minor surgery. It brought a big smile to her face. It was great. My grandchildren thoroughly enjoyed them. I ordered a birthday arrangement for a child's first birthday. I wanted something special , and that's what he received. It was a beautiful arrangement of balloons and a teddy bear. The picture sent to me as he held the balloons was priceless: a very HAPPY face! THANK YOU! I sent this to my niece for her high school graduation. She was pleasantly surprised by it and said the balloons and bear were beautiful. I included a rose with my order which she also liked. Although I did not receive a picture of the balloons, I could tell from both my niece and sister-in-law that they were the correct ones in the product description. I was quite happy with how quickly they were delivered. I requested same day delivery and they were delivered a few hours after I placed the order. Thank you! Delivery was prompt, friendly and my nephew loved his Birthday Balloons and Bear. Thanks for making this so easy and the availability of same day delivery was great! Thank you very much for your wonderful job well done! :) My granddaughter loved her balloons and a little bear. and the little bear is adorable! Very soft and cuddly! order! Thank you so much! Sweet presentation & delivery within a day ! Bought a gift online from the UK for someone on holiday in Houston was an easy and fast service would highly recommend thank you! The child was so excited and his sister and brother were jumping with joy. They loved the balloons and the stuffed bear was a big hit. Balloon and teddy bear lover. My sister loved this item. I only saw a picture of the item,but understand that the 4 year old that received the package loved it - It really brighten her stay at the hospital. Thank you very much for helping me make my best friends birthday a truly special and unforgettable one. The surprise and look on her face was awesomely priceless! And your timing was phenomenal, considering I had just placed the order the night before. I am definitely a life long customer and will be referring your company to all of my family and friends.